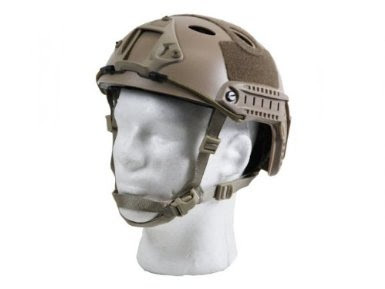 I had the following question in on email: “What are your thoughts on tactical headgear?” – the pirmary direction of which was to ask about helmets. What are we wearing headgear for? Ballistic Protection? Sun/Rain Protection? Camouflage? Because it looks good? Or some or all of the previous? Head gear, in particular helmets, also gets in to the realm of profile and the appearance that you are going to give onlookers, bystanders, enemy, law enforcement etc. These are all considerations that you must take into account. Helmets: A military style tactical Kevlar helmet is not ballistically protected against high velocity rounds. 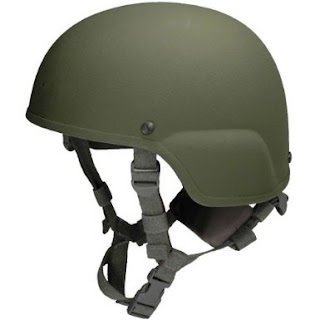 Generally, these helmets will protect against pistol rounds, shrapnel and will provide a level III protection which is roughly the same as soft body armor. Yes, thee are stories of helmets saving people’s lives, but mostly due to a helmet deflecting a strike – high velocity rounds can behave unpredictably once they hit something Due to the generally protective nature of a helmet and the vulnerability of your skull, if you have one of these handy, I would suggest that you keep it around and wear it for any type of high intensity battle that you ever take part in. It will also protect your head, for example if you are doing any sort of work in or around buildings, it will stop you banging your head. HERE is an example on Amazon. I am of the opinion that most people will not wear a Kevlar helmet most of the time, and thus it is best to keep it ready for any kind of set piece battle, such as defending your retreat or similar actions. 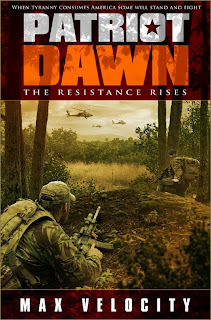 I have my Resistance fighters in ‘Patriot Dawn’ wear them for operations, but not for patrolling. Many modern helmets, in particular the more ‘high speed’ types, are not well camouflaged. This is both due to a lack of a camouflaged helmet cover but also due to shape. If you are serious about wearing a helmet in combat, you need to give consideration to breaking up the obvious shape of it, with some sort of burlap or camo material. This can be altered to be better for your environment, i.e. woodland or urban etc. So you have to balance the use of a helmet and the protective benefits it will give you, against the inconvenience of wearing g it, particularly in the heat, and the likely threats you may face. If you think the trade off is worth it, you can drop down from a ballistic helmet to a purely protective one, such as a Pro-Tec which is purely there to prevent bangs on your head and concussion etc, depending on your activity. Pro-Tec helmets are not only suited for dynamic activities such as building entry, fast roping etc, but also for vehicle crews. They were adopted at one point as an alternative to ballistic helmets for crews of up-armored close protection vehicles in Iraq. This was because often an IED strike would often not cause injury by itself, but due to high speeds would result in a roll-over crash Smacking your head against armored glass is not healthy, so if you are moving about in vehicles, armored or not, consider wearing a Pro-Tec style helmet. One thing that is overlooked and that it is important to consider as a reason for helmet use is for night vision. I have discussed before the importance of night vision and that the best way to do it is to head mount the night vision device, such as a PVS-14, and then rely on an IR laser device on your weapon to join up the disconnect between you seeing a target through the NVGs and having to bring accurate rifle fire to bear on it. However, you may not want to wear a ‘head crusher head harness to mount the PVS-14 to your eye. If you have a helmet mount, that is an ideal way of wearing the night vision device in better comfort. To mount a night vision device you can use a traditional military Kevlar with mount, you could use a Pr-Tec style helmet, or you could go for one specifically designed. 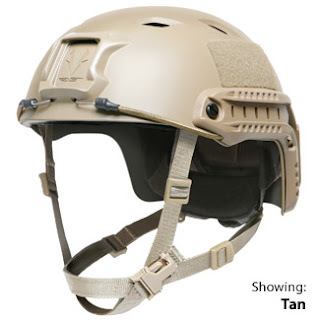 For example, the FAST Helmet is available from Ops-Core HERE – you can go for a ballistic one for around $935 (and also look super high speed!) or you could drop down to the ‘base jump’ version at $239. Note that these have an integral attachment point for your NVG mount. So, depending what you spend you may end up with a ballistic helmet you will wear all the time, or a non-ballistic one that will be worn when your head needs protecting form bumps and bangs and also at night as a base to mount your NVGs on. OR – if you want to go super-cheap and want a night timeonly head mount for your NVGs, then you can look at knock-off airsoft versions. These will still protect your head from bangs and scrapes as well. HERE is a link to an example on Amazon at around $80. So my point is that you need to decide if you want ballistic protection, which will most likely not stop any high velocity rifle rounds, or if you just want bang and scrape protection for your skull and/or possibly a mount for your NVGs. If you did not want a helmet or possibly were only using one at night as an NVG mount, then that leaves us with what to wear during the day. The possibilities are infinite and you will want to consider sun protection (visor/brim), camouflage and also possibly warmth if you are in a cold climate. For patrolling activities the best possible soft hat is the ‘boonie’ style wide brimmed floppy hat. This provides sun and rain protection with the floppy brim and also breaks up your shape better than something like a base-ball cap. Other than that, its up to you, whatever you think is appropriate, comfortable and helps you do your job. Let’s face it, most people in the U.S. wear baseball caps, right? Timely post for me. I just picked up a MICH helmet off of Amazon a couple weeks ago. I had actually gave some thought to when I would want to wear it and when it might not necessarily be appropriate. Your comments reflected what I was thinking: I would most likely put mine on for a known engagement or if going into a known conflict, but otherwise, I would not wear it as in the example of your patrol i.e. unknown what you may run into. Good blog post! I have been running through this in my head for a while. Trying to decide the pros and cons. I have been planning on getting NVGs, never thought of using the lighter cheaper airsoft helmet to attach to! Lots of good information to help me make informed decision. Small detail correction: A military ballistic helmet provides “IIIa” protection, which is basically against all pistol rounds. Level “III” (or even “IV”) are rifle protection levels. They sound similar, but are not to be confused.